This is a book that should have a permanent place in the bookcase. A place we can easily go to when a question pops up in church or after devotions. 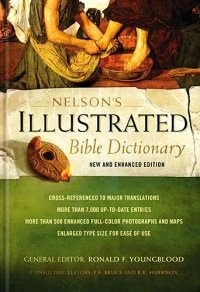 Nelson's Illustrated Bible Dictionary provides big and colorful pictures and well written explanations on every subject I could imagine that pertains to the Bible. There are over 500 full-color photographs and a whole set up maps that show the major periods of the Bible. I especially liked the study and teaching outline included for each book of the Bible. Thomas Nelson provided me with a free copy of this book in exchange for this review which I freely give.